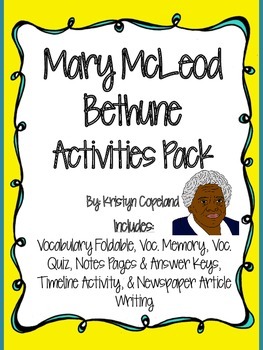 **Mary McLeod Bethune Vocabulary Memory Game: Includes instruction sheet; answer key, memory cards for the 7 Mary McLeod Bethune cards to make them cute, and a blank template to write in your own vocabulary words and definitions. 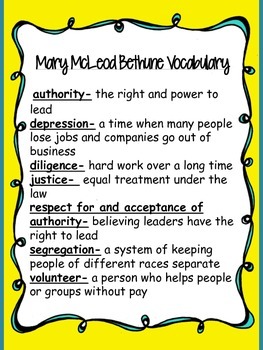 **Mary McLeod Bethune Notes Sheets: These go along with the American Heroes: Mary McLeod Bethune Book. 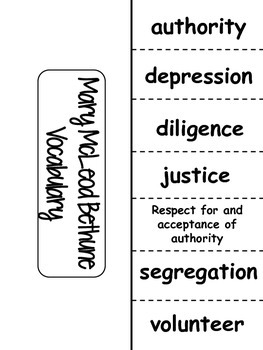 It has questions for chapters 1-5 and vocabulary. 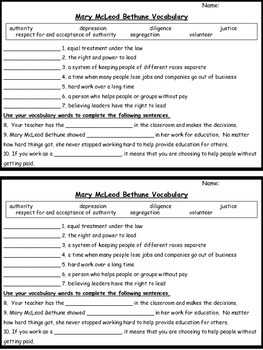 It also includes an answer key.